I created the first Landing Page a few days back and generated good 40+ leads consistently within 5 days with free advertising and no additional promotions, no doubt…the process was partly successful! However, I realized that I had spent more time and energy than what was actually planned! I was saving the leads generated into the list manually whereas it should have been automatic! I was spending time redirecting people to other pages despite the fact that I had a landing page with sufficient information! I was unable to receive payments from a few people despite putting up Buy Now buttons. Some people outright refused buying the service despite discount offers and free bonuses! Nobody subscribed to my list despite the fact that the page received great traffic as per statistics! Nobody subscribed to my YouTube Video nor did they like it despite the fact that the page had a nice good looking video on top of the page! Nobody subscribed even to the free service, forget the paid ones despite me offering Bonuses on the Free Service! So what were the mistakes I made? 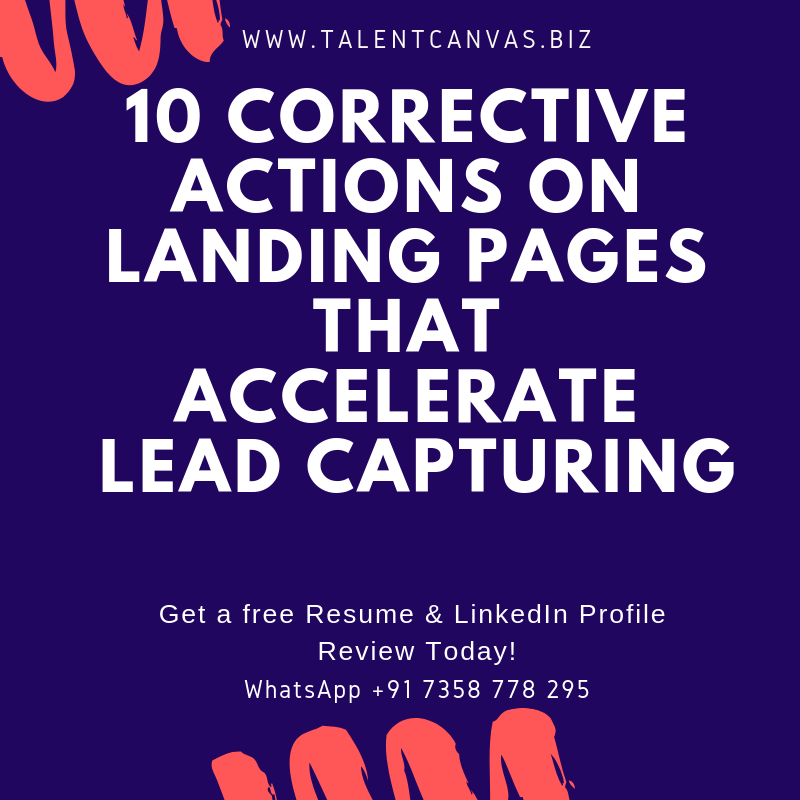 Note that these are mistakes that one should avoid if their aim is to collect lead e-mail addresses with minimal efforts. Putting up a video which does not feature you: This lowers the interest rates among the visitors. The Video may be useful and informative, however, if it does not have a personal touch, people tend to get diverted and leave the page. Put up a short video with you speaking to the audience, explaining features of the products/services, inviting them over to subscribe as well as encouraging them to buy your products. Putting up a boring headline below the Video: This will not inspire visitors enough to scroll down the page and have a look at your products or services. Put up a headline that is attractive, already used in the Video and something that offers much more added value besides just selling the products or the services. Putting up your contact details on the landing page: This will redirect people to call you or email you instead of making them subscribe to your email list! You will lose out on the lead capture opportunity and will end up spending more time doing manual entries! Remove your contact details from the landing page and let people see just the sign-up form first. You may provide your details in the next funnel as and where appropriate but the first step should be to capture the email lead easily and effortlessly. Putting up Menu links on top or Ads on top: This will distract the visitors and encourage them to navigate away from the landing page and therefore, you end up losing the lead capture opportunity! Remove all Menu links from the top of the page and do not put up advertisements so that people may simply view the video and subscribe using the sign-up form. Putting up Buy Now buttons that offer limited transaction ability: Paypal buttons are the most easiest way of receiving payments, however, within the country, e.g., India, payments cannot be accepted. Likewise, there are currency restrictions at times, which may disrupt the smooth payment process. Use a Payment Gateway such as ccavenue or Instamojo, which will make your life and buyer’s lives much easier. You will neither have to provide Bank Details for wire transfer nor will you have to worry about currency factor! Putting up incomplete information about your products and services: This will result in arousing insufficient and half-hearted encouragement in visitors and eventually you will end up running after them to convince them if they do happen to call you. Most of the times, visitors will leave the page and you will waste the traffic and the customer. Include samples of services and products and write and talk as much as possible about all aspects of your services and products so that prospects get a complete overview of your products and services. The more you work hard on your first landing page, your subsequent pages become easier to create! Small, invisible to you spelling and grammatical errors in the content: Geez! This gets embarrassing when people tell you about the careless spelling mistakes you made on the page. Good to edit the content several times before you publish it so that even the errors that you didn’t notice the first time, you soon do and remove. Creating links that do not open, especially when you are promoting the link on social media etc. : This will irritate the visitor who may want to have a look at your page quickly and decide to buy the product/services. Eventually you may lost out on the customer if they tried too many times and failed to open the link. Create cloaked links, if at all you are doing so… that are thoroughly checked, do not get blocked by firewalls as much as possible and are easy to remember, besides being short. Redirecting to a page that does not open : Imagine how embarrassing it is when you have spoken at length about the product/service and made the customer go through unending pages of content, only to redirect them to another sales page/funnel or website, that does not open :-(. The customer will literally feel let down and may not want to visit your page again! Make sure that the pages and funnel links are doubly cross-checked before you redirect visitors to make purchases etc. Offering a Price much higher or much lower them Market Standard: Customers are quite smart and they often compare several services before they make buying decisions, isn’t it? If they are offered an unrealistically higher price, they will reject the offer and if they are offered an unrealistically lower price, they will assume your products or services are of poor quality. Double-check your sales offers, bonuses and pricing structure multiple times before you float around the landing page to your prospects! This will improve your sales to conversion rates much faster and effectively. Wish to start a Home-based business? Visit my LinkedIn profile and get in touch! Get a Free LinkedIn and Resume Review by filling up your details here.